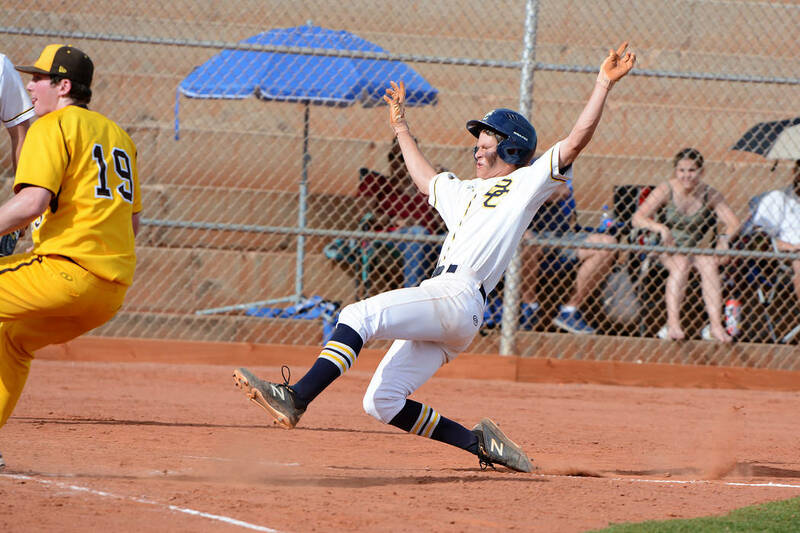 (Robert Vendettoli/Boulder City Review) Breaking a 2-2 tie in the bottom of the second inning, Boulder City High School sophomore Scott Bahde slides into home plate against Bonanza on Monday, April 8. The Eagles won 12-2. Trailing 2-1 after the first inning, the Eagles erupted for five runs in the bottom of the second to put the game out of reach early. Sophomore Joey Giunta batted 1 for 1 with three runs batted in, and sophomore Blaze Trumble batted 3 for 4 with an RBI and two doubles. Sophomore Troy Connell batted 1 for 3 with two RBIs, while sophomores Matt Felsenfeld and Deavin Lopez each batted 2 for 3 with an RBI. On the mound against the Bengals, Connell threw 3 2/3 innings of relief to earn the victory, striking out five batters and allowing no hits. A key bounce-back victory after their emotional loss at Moapa Valley, the Eagles played soundly after several mistakes during the prior game. Falling 7-4 to the Pirates, the Eagles attempted a come-back bid after a 7-0 deficit but were unable to capitalize. Trumble batted 2 for 4 with a pair of RBIs against Moapa Valley and senior Jimmy Dunagan batted 2 for 3 with an RBI. Experiencing their first share of growing pains as a young club, Giunta was charged the loss after throwing 2 2/3 innings, after allowing seven runs on five hits. The Eagles will resume their season Monday, April 15, in the Blazer Spring Bash.